About a month ago I was sitting behind my computer googling fennel recipes so I could use up an extra fennel bulb I had purchased but not used. I’m new to the world of fennel so I wasn’t quite sure how I should use it. Enter Martha Stewart. Girlfriend always has the answers to life’s tough questions, you know? I found this wonderfully decadent yet delightfully simple recipe on her site and it has since become my go-to dinner when I’m too lazy to make something real. But I took it a step farther than Martha. First of all, her recipe for caramelizing the fennel and onions only takes about 15 mintues–this seemed wrong. Caramelized onions are a gift straight from the heavens and I’m not about to cut corners and risk missing out on ANY of the flavor that comes from a proper caramelization. Secondly, her recipe makes a LOT of caramelized goodness, but you don’t necessarily need all of it for one pizza. So below you’ll find my slightly altered approach to this gorgeous pizza. Enjoy! 1) Start by making your dough. I followed the smitten kitchen recipe exactly so you can find the directions over on her page. You’ll need to let your dough rest for about two hours so make sure you plan ahead. If you aren’t a “plan-ahead” kind of gal, just buy some dough from Trader Joe’s and skip to step two. 2) Heat your first 3 tablespoons of olive oil in a large saute pan. You want to use a pan with a large surface area so the onion and fennel can receive somewhat equal heat while cooking. Once your oil is hot (you’ll see it do a little shimmy!) throw in your fennel and onion. At this point I like to season it with pepper but not salt. It’s REALLY easy to oversalt this because it cooks for a lonnnngggg time so just start off with a bit of pepper. When you’re caramelizing you want to do so on a medium heat and avoid stirring too frequently. I stir mine about every ten minutes or so for the first 30 minutes then towards the end I stir them a bit more often to avoid burning them. If your onion/fennel mixture starts to look dry at any point you can add a bit more oil or water. Cook these for 45 minutes to an hour. Then turn the heat off and move on to step 3. 3) In a new pan, heat up 4 tablespoons of olive oil. When this oil gives a little shimmy add your rosemary and garlic. Cook for about 3 minutes (you’ll be able to smell the gorgeous rosemary) then turn the heat off and take out the extra rosemary if that’s your style. Personally, I adore rosemary so I left a few leaves in my oil. It’s your call! 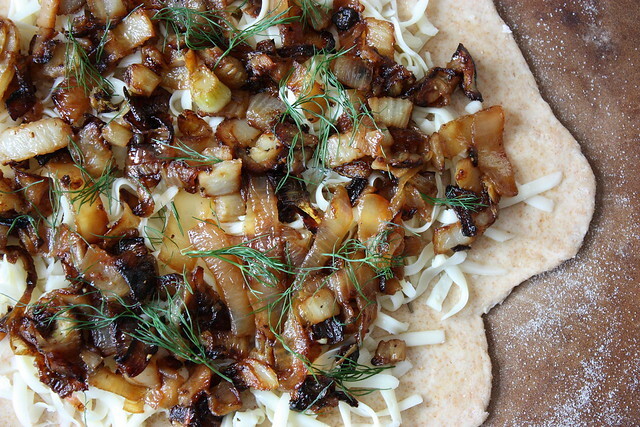 4) Roll out your dough on a slightly floured surface and add your rosemary oil, a layer of fontina, and a layer of your caramelized onions and fennel. Top it off with a few of those pretty green fennel fronds and put it in your oven on a pizza stone for about 10 minutes at 500 degrees (or as hot as your oven will go). It seems like a lot of work but it’s really just a lot of wait time. The great thing about this recipe is that EVERYTHING can be made ahead. Caramelize your onion and fennel then put them in an airtight container till you’re ready to use them. Buy your dough pre-made to avoid waiting for the dough to rise. If you skip the extra steps or break them down to one piece at a time it becomes much less daunting. Hey Mel!Fennel actually tastes a bit like an onion but far more mild. Definitely doesn't resemble black licorice in any way! It's pretty delicious and goes well in tomato-based pasta sauces too :). I have to admit, I've never cooked with fennel. I have made a carmelized onion tart before though – using a sheet of puff pastry and blue cheese – it flew off the tray at our Superbowl party. This looks good, though I still wonder if I'll like the fennel – does it taste like black licorice?